Instant Delivery: In most case, the key will be sent via email within 30 minutes, but it will be delayed (up to 12 hours) if order at night (our local time). If you haven't received the key for hours, please check the spam/junk mail folder. Multi Language Support: German, English, French, Spanish, Czech, Danish, Netherlands, Hungary, Japanese, Croatian, Polish, Portuguese, Russian, Swedish, Chinese, Bulgarian, Finland, Norwegian, Greek, Korean, Turkish, Ukrainian, Thai, Italian, PT-BR, Arabic, Romanian, etc. No matter what help you may need with downloading or installing Office 2013, we've got the expertise you need. We'll give you the support you need until your software is up and running. 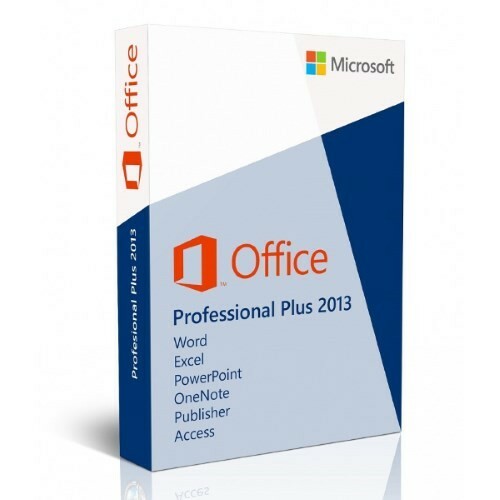 Office Professional 2013: This retail suite includes the core applications Word, Excel, PowerPoint, and OneNote plus Outlook, Publisher and Access. Office Professional Plus 2013: This suite, only available through volume licensing channels, includes the core applications Word, Excel, PowerPoint, and OneNote plus Outlook, Publisher, Access, InfoPath and Lync. Modern Style Interface: Everything is minimalist, flat, and stark. Microsoft has already upgraded the WebApps for Word, Excel, OneNote, and PowerPoint with the new Modern-style look and Office application color coding. SkyDrive Integration: Office 2013 is designed to integrate with the cloud — with SkyDrive and SharePoint, in particular. Syncing Across Devices: When you save your Office documents online, they’ll be available to you (and others) from any device at any time, via Office 2013 on a PC or tablet, or via the WebApps. Touchscreen use: Click the Touch Mode button on the Quick Access Toolbar — to the right of the program logo of each application — and the ribbon toolbar spreads its icons further apart for easier access to fingers. PDF Editing: The new Word 2013 can open PDF files, edit them there, and then save them as either DocX files or PDFs. Formatting Task Panes in PowerPoint: Formatting images, shapes, and other objects in PowerPoint is now more intuitive. Easier Charting: For users confused by the plethora of charting options in previous versions of Excel, the new Recommended Charts feature is useful. Account Login: Office 2013 is more cloud-based than previous versions; a domain login, Office 365 account, or Microsoft account can now be used to sync Office application settings (including recent documents) between devices, and users can also save documents directly to their OneDrive account.